We have had a great experience here working with Lena. I have purchased now two vehicles; 1) Toyota Sienna, and have had it 2yrs or so. No problems, been working good, very pleased. Lena was great as well. 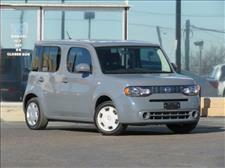 My wife just bought a Nissan Cube and of course, after all of her research, the best deal/price was at fiction auto. She loves her little car and again great people there at Diviton. Our next car for my daughter we also plan on getting from Lena. That should say a lot for this place.